Up and at 'em this morning. We have a busy week ahead and I needed to get some things into the fridge for healthy, quick meals. I have been snacking on junky, sugary, carby foods lately, and today recommitted to a my normally healthy way of eating. So, after a breakfast of whole wheat toast and egg white/veggie omelet, off we went, into the city to pick up some fresh veggies, fresh fruit, and a rotisserie chicken. And, some snacks for The Captain... just cause I am cutting back on cookies doesn't mean that he is! 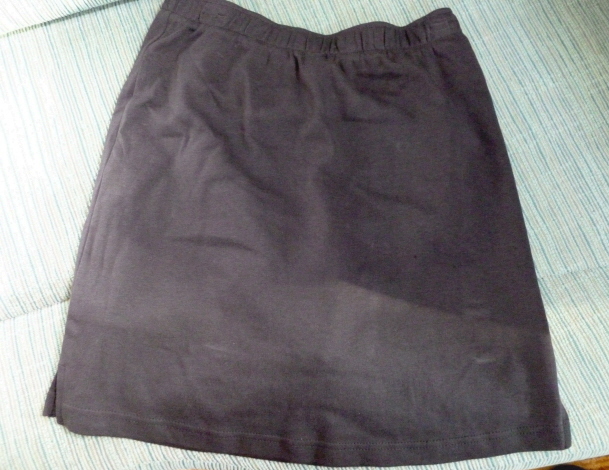 I scored a treat of a different kind... a George running skirt for $3. It was the only one on the rack and I quickly put it into my cart, thank you. It actually is nicer than this picture looks! Not sure why it appears to be so wrinkly. Back on board, I put groceries away and mentally planned my morning run while The Captain started preparing for tomorrow's haulout... more about that later. I put on my heart rate monitor, and my running togs, and quickly downed a cup of coffee. Then I poured some lemon juice into the bottle of water I had decided to pack and off I went. I couldn't think of anything I could take as a running snack ( I need to get some jelly beans, I guess) and my thought was that the lemon juice would at least add a few calories to my water if I needed them. Today's run was supposed to be the same 10 km route that The Captain and I covered on our stroll around town yesterday. And it did start out that way... I loped along at a fairly slow pace about 75% to 80% of max and it was really comfortable. There were lots of people out and about on the path today as the sun was shining and it was a glorious summer day. My speed and heart rate varied along the way. Sometimes I was as high as 95% of max and others as low as 75%. I didn't do any walk breaks at all and even when drinking from my water bottle, I managed to keep running. By the time I arrived back at the marina, my water bottle was empty and I was so glad I had put the lemon juice in it. I was hungry! And I do think the lemon juice helped stave that off a bit. I was hot though, so I walked around the marina, enjoying the breeze off the water for another 12 minutes before I came back on board to stretch and start making my lunch. I learned that one of our long-time boating buddies, a man from Greeley, Colorado, is going to be arriving here in his 68 foot Queenship, from Roche Harbor, WA this afternoon... so we will make so to get in a visit with him this evening. And then tomorrow morning, the work begins! We will be driving the boat to a location just outside our marina, where there is boatyard. We will back into a slip there, and be picked up and 'hauled out' of the water by a travel lift, and someone will pressure-wash the bottom of the hull. After that is done, they will put her on a series of cradles, and we will spend the next couple of days doing maintenance work... and of course we are not sure exactly what that will involve until we see the hull. But, for sure there will be taping and painting. Perhaps some scraping and sanding.... and I will be cleaning and polishing the propellor and the propellor shaft. It is very odd being out of the water. We have to climb up a ladder to get into the boat. And being in the boat, when it is out of the water, on the 'hard' just feels wrong. There is no action and it feels like we are going to fall off the cradles. Have you ever tried walking on solid ground after jumping on a trampoline for several minutes? It kinda feels like that. We can live on the boat while it is out of the water, but it is like dry camping. We can use the fridge and the stove, as we will have power, but we cannot run water into the sinks cause we cannot use the drains. I will do dishes in a pan and then have to take the dishwater to a disposal area. And no showers on board, of course. Anyway, I am not anticipating any problems (she says, feigning bravado - keep your fingers crossed) and we plan to come back to the marina on Wedesday afternoon... no internet or cable tv - so no blog posts here... and I have prepared a couple to auto post on my food/recipe blog We can begin to feed... while we are away. Here are a few pics from a previous haul out so you can get an idea... and of course I will be taking lots this time, too, and will do a post when we get back. Still in the travel lift after being pressure-washed. Look at that shiny little prop! Bottom is painted! Most of the work is done. The Captain puts applies some final paint before we go back into the water. It must be so bizarre to be on your boat on dry land. My parents live on a boat, but they don't stay one it when it goes in for maintenance work each year. They usually make a little vacation of it and stay in a hotel somewhere. Nice job on the run, definitely bring some snacks along next time!